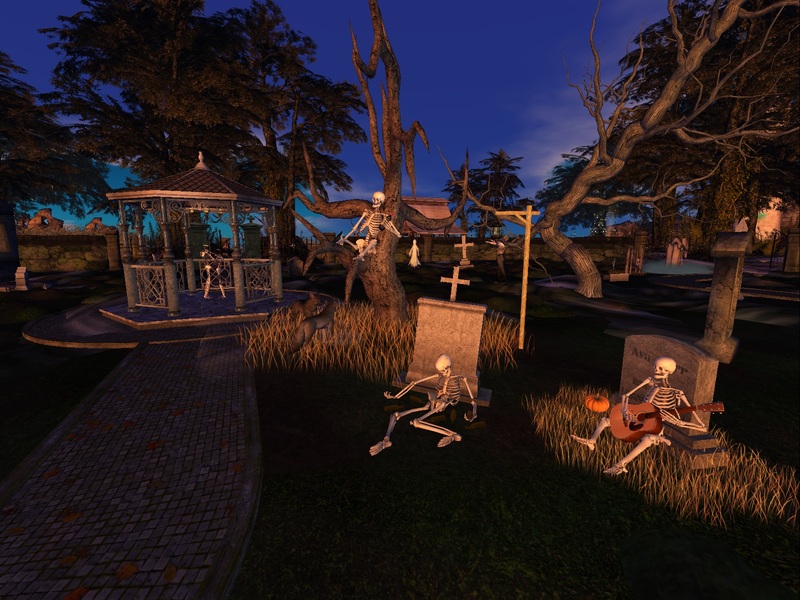 Today is the Linden-organized Halloween-themed "Creepy Crawl" event. But it hasn't been the only venue crawl going on. Last Friday, the four clubs of the Furry Club Alliance held the first event involving all of them since the newest member joined: the FCA Furry Halloween Club Crawl. For ten hours, people danced as they enjoyed the music and spooky scenery. 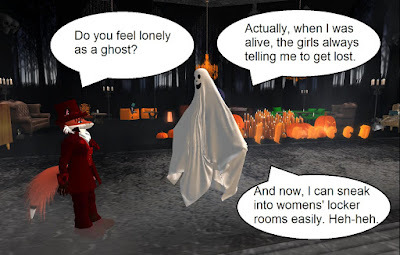 Since 2015, Linden Lab has held a "Creepy Crawl" event in Second Life every Halloween. And this year marks the fourth. On Monday afternoon, Xiola Linden posted the schedule in the official blog. The event will go over eight locations in four hours. Read the blog post in full (here). It's the week that sees Halloween, and the few days after when we recover or miss the spookiness. Here's what's going on at the Sunweaver and Montecito Bay clubs and the Furry Fashion Lounge. Congratulations to the winners of the "What Luskwood/Trotsdale/Derpland means to me" memories/birthday contest. Logging in I see 9,415L as the final amount to be divided between the winners. There were 7 winners/entrants so this gets divided 7 ways! Disbursement has gone out via "David Valnarius" (Midomaru Resident). DON'T FORGET THERE IS STILL THE HALLOWEEN SPOOKY STUFF WRITING CONTEST. Currently 1400L up for grabs. Editor's Note: The Luskwood 15th Anniversary Party is still being planned, but no date has been set yet as far as we know. From Halloween Town. It wasn't my intention for the picture to end up like he was on my foot, but it worked out. Second Life has a number of Halloween-themed places every October. One of the most familiar is "Halloween Town." 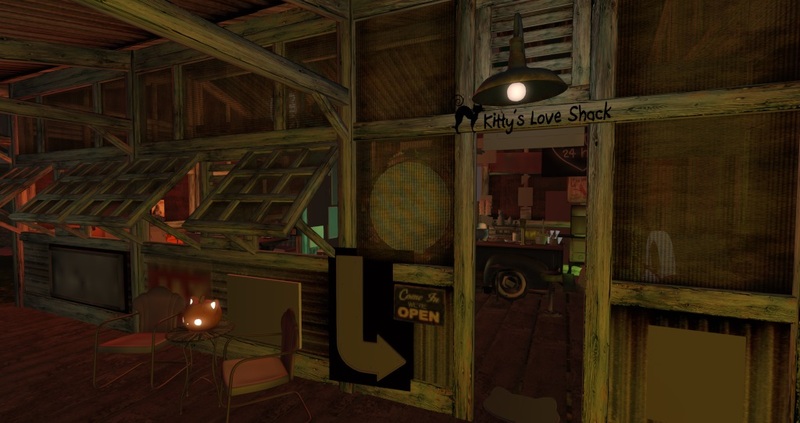 The themed town of Laura Liberty's "Townies" sim, the place is more playfully spooky than scary. While the place has a lot shops, there are other things to do, such as a pumpkin decorating contest and the haunted house. 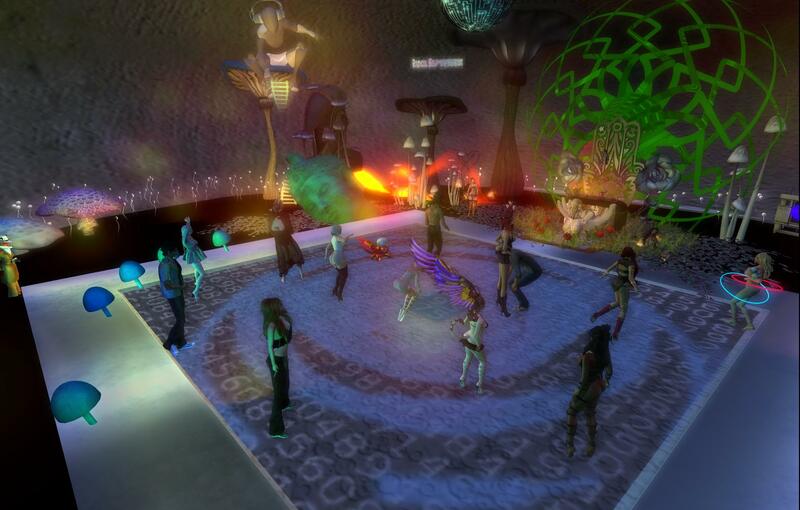 If you had trouble logging in Second Life yesterday, Sunday October 29, you weren't alone. Facebook had a number of people asking, "anyone else having trouble logging on?" As it turned out, plenty were. In various groups I am in, and among those I ran into, people were complaining that it took multiple tries for them to get on, and were sometimes crashing. On the Grid Status Report, throughout the day, it was stated that these troubles were an issue, and Linden Lab was working on it. As of 9PM SL time (Midnight EST), these problems were still going on. Quite a bit happened this weekend. The Burn2 art and music festival ended this weekend with the high points being the Burning of "The Man" (pictured above) and the Temple Burn. The "Creepy Club Crawl" took place between four clubs over ten hours. Caledon had the "Screampunk Ball" and a Halloween party at the Goblin Cave. There was a "Be the Match" fundraiser for bone marrow testing and transplants. 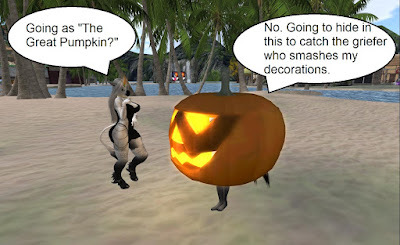 There was the Halloween Madness in the Confederation of Democratic Simulators, and more. More on some of these events later. Taken at Club Cutlass' "Videogames" event, with Dusk as "Kangaroo." SQUEEEEE! ONE OF OUR FAVORITE WEEKS OF THE YEAR! We DO love October. Did we mention that? And here we are at Halloween Week - one of the most story-full weeks of the year. **SUNDAY, October 28th, at 1pm (2 hours): SPOOKIN' IT AT OCTOBERVILLE - Stories and Poems for the season at Octoberville: Shandon Corwyn, Finn & Caledonia, Live. If you are not already "Octoberville enabled, then come to the Library where you will be manually teleported to the story camp - BUT BE WARNED! Octoberville fills up very fast, so . . . consider arriving early! **MONDAY, October 29th at 7pm: John Brunner's THE INFINITIVE OF GO continues with Gyro Muggins. 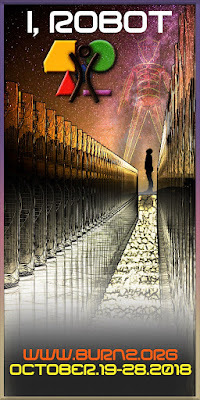 ~ at 9pm - SEANCHAI LATE NIGHT, contemporary Sci-Fi-Fantasy with Finn Zeddmore. Press release : "24 hour Ride for Be The Match in Second Life This Weekend ! This weekend ( October 26 th and 27 th, 2018 ) the Cobras MC is doing a 24 hour ride for Be The Match ( http://www.bethematch.org ) . From Friday, October 26 th at 6 PM SLT untill Saturday, October 27 th 6PM SLT , we will ride on different tracks during this event. Be the Match is a bone marrow/cord blood registry that not only helps people find matches, but helps donors with logistics and expenses so that they can feel free to donate marrow. It is easy, a simple swab in the cheek... go to the website for a test kit to send back. If you are NOT in this age group or in good health, you can donate or volunteer from the following site as well. They need your dollars and time to coordinate and care for donors as well as those who are ill.
Be the one that can give a ride to the hospital or take a donor to lunch.. Be the one that can put a couple dollars (even $5.00 helps!) in the pot and get an instant email with 501 (c) information back.. go to the Website..
BE THE MATCH TO SAVE A LIFE! It costs about $100 to add each new member to the Be The Match Registry. This is to cover the cost of tissue typing and storage, as well as materials and administrative expenses. 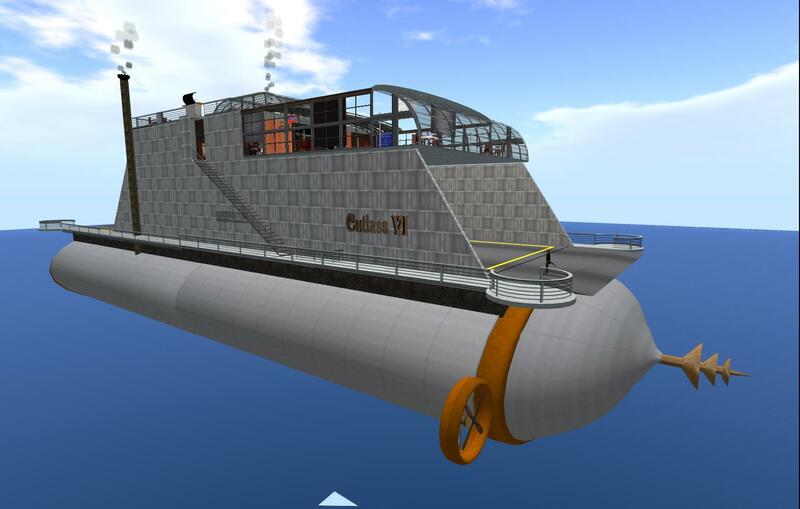 If you are age 18–44, Be The Match covers the cost to join for the people on SecondLife (during the campaign only! From October 26th through November 5) through funds provided in part by generous mission supporters. If you are age 45–60, you will be required to make a $100 payment to cover the cost to join. The reason: Younger donors, ages 18–44, produce more and higher-quality blood stem cells that lead to better transplant outcomes. Transplant physicians request younger donors more than 95 percent of the time. Requiring individuals ages 45–60 to cover their own cost to join helps Be The Match maintain the best registry for patients and make the best use of its resources. "DEM BONES" Ride 25 Tracks in 24 Hours raising awareness of Be the Match.. Cord Blood and Bone Marrow Transplants. Information and gifts given out during rides and after..Full Schedule for the 24 hour ride. Everyone will go home with a new vehicle of some type whether you ride one or all 25 rides! You are welcome to ride just one, any, or all of the 25 rides. Please have lots of fun, enjoy the ride. When you come back to these tracks tip them well. They might even allow us to come back next year :).. See you at the ride! MORE Be the Match Events to follow.. look for them! Today marks the high point of the Burn2 festival: the "Man Burn." It takes place at 10AM SL time and once more 4PM SL time. Tomorrow marks the last events, including the Temple Burn, which is also 10AM and 4PM. Besides these two, be sure to look for dances, DRUM, and other events. And of course, all of those exhibits. Space" one. 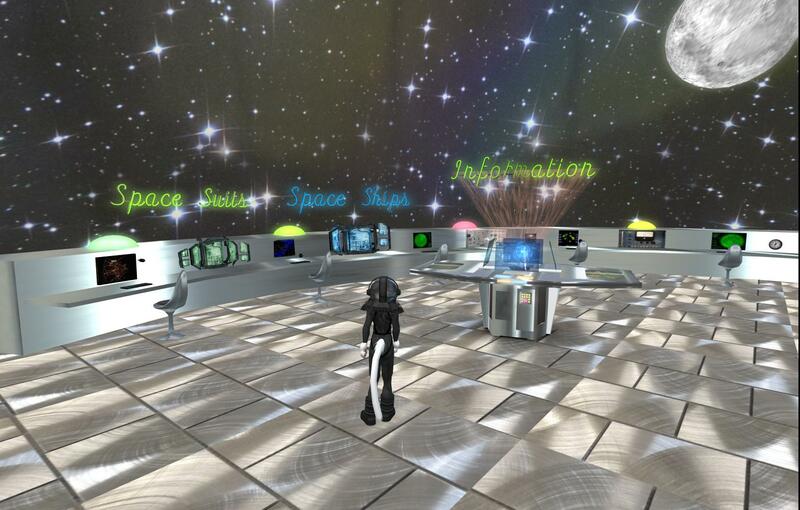 Made by Lillithslair (Lillith LoneRaven) and located at Electric Sheep (186/72/24), stepping inside, clicking in "Mission Control," one can take a trip to Earth orbit, or perhaps to the outer solar system, or maybe to a crystal world where you can take home a few samples for a souvenir. Of course just going in space in regular clothes is not always a good idea. Click on "Space Suits" on the panel to get a suit that gives you some protection from hostile environments (protection against hard vacuum is limited with hands and other body parts unprotected). Clicking on "Space Ships" will give you a small ship that can get you about short distances, or perhaps a longer journey with some assistance. For the automated tour, turn off any AOs, walk inside the large metal tube, and sit on the poseball (after wearing a suit or getting in a mini-spaceship). Taken at a Caledon Halloween party. It's been stated someone becomes a ghost if they have unfinished business. So if a guy has an unsatisfactory love life, might he as a spirit haunt places where they can watch the girls like they never could before? While the Halloween season has brought plenty of haunted houses and costume parties around Second Life, that's not all that's going on. 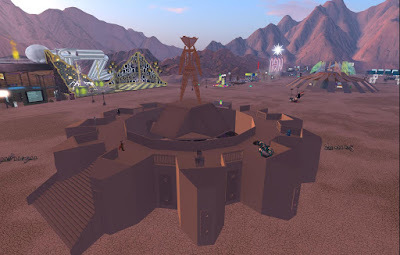 Taking place on Burning Man - Deep Hole and four other sims is the Burn2 art and music festival. This year's theme is "I, Robot," and many of the exhibits involved robots. But there was also plenty of music performed by DJs, and other performances such as dances. 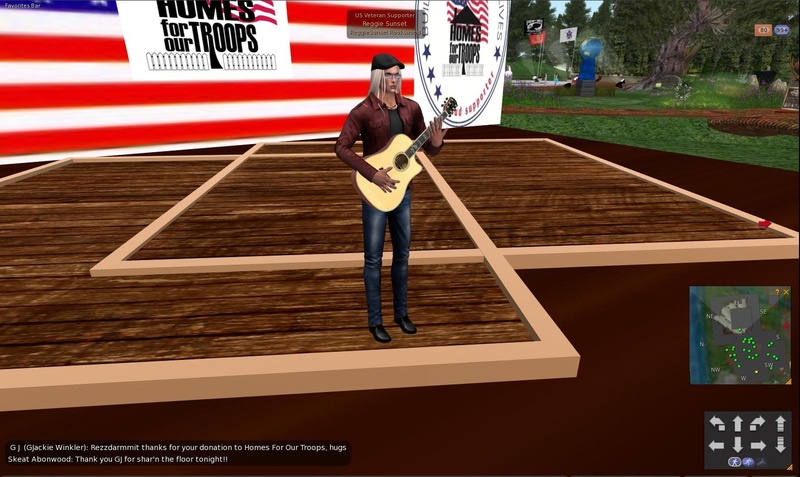 On Sunday October 21, Veterans Isle was the scene of their monthly benefit concert. 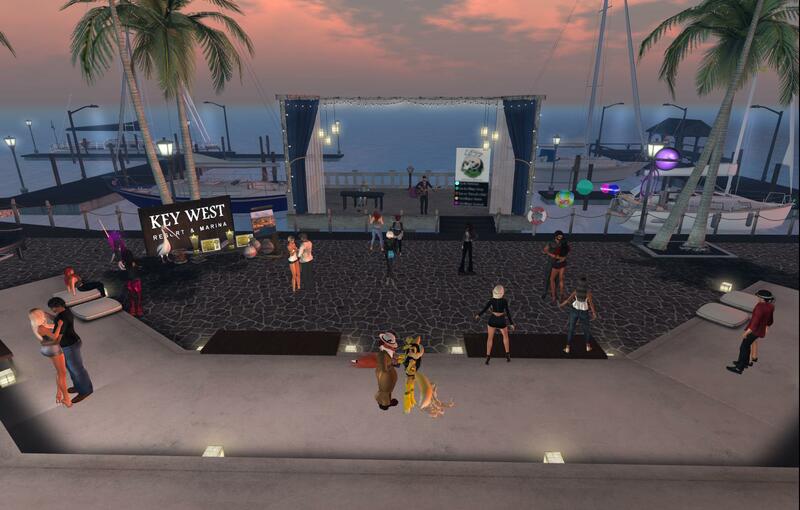 The event, organized in part by Frets Nirvana, had a DJ and several musicians singing live for donations. The money raised goes to the Homes For Our Troops charity. 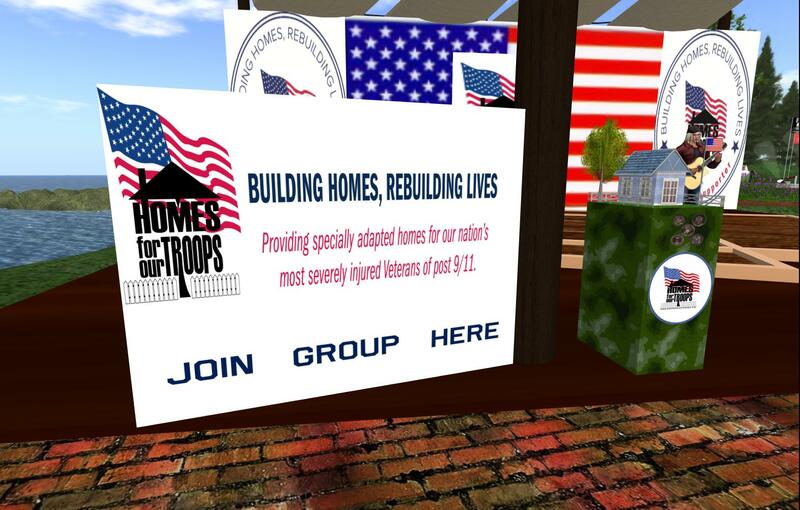 We are sponsoring our monthly benefit for Homes For Our Troops tonight. Waya Snowpaw has already kicked it off. Up next is Amforte Clarity at 5 PM! Come on out …support this great cause and have a great hour of music! As the performers were on stage, people in the crowd put cash in house-shaped kiosks on either side of the stage. 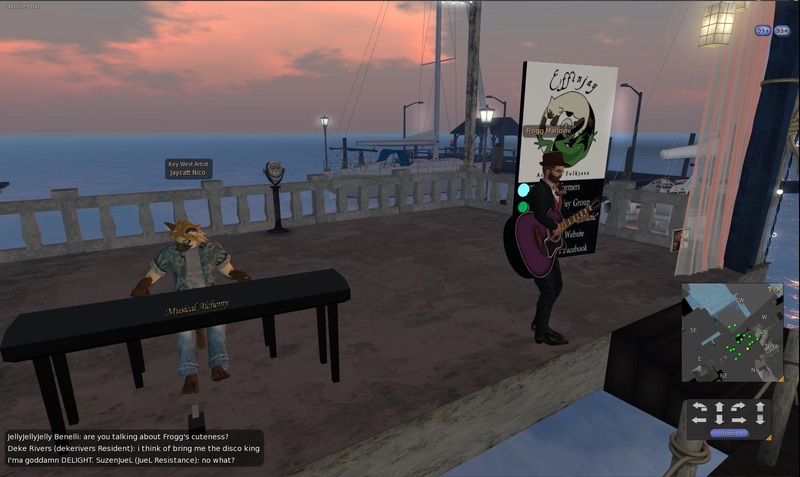 Last on stage was guitarist Reggie Sunset, whom sung until about 9PM SL time. By that time, 135,840 Linden dollars had been raised. "Thank you everyone for coming out and supporting HFOTS! We appreciate you all. And Mr Frets! Thank you!" 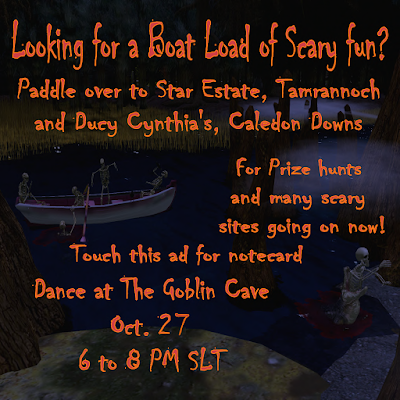 Come join the party On Oct. 27th from 6-8PM SLT for a Halloween Dance at the Goblin Cave. The music will play across the whole sim of Caledon Downs so one can explore the sim and still be entertained. 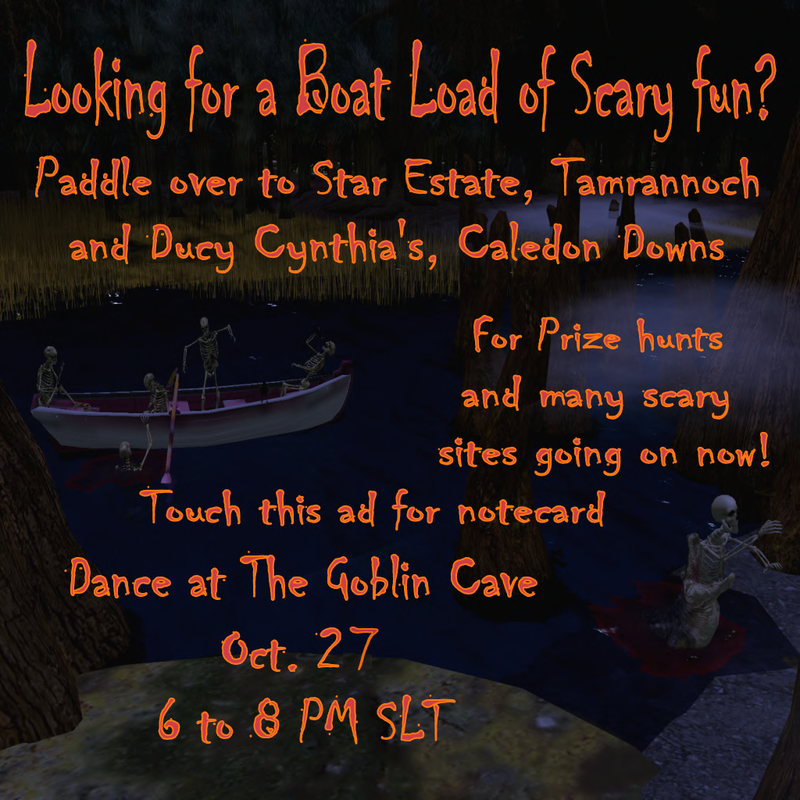 Duchy Cynthia Farshore and Star cordially invites you to Caledon Downs and Star Estates, Tamrannoch for a sim and a quarter full of Halloween fun going on now. There are many, many horrors and hunts with prizes. Star Estates has a cube hunt and Duchy Cynthia has on Caledon Downs has a Pumpkin hunt with 5 little pumpkins to be hunted down for different prizes. One can even shoot spooks at a shooting gallery. Lots to explore and see. Witches fly by the moon's dim light, / Werewolves will howl into the night, / Join us if you dare / For a night that’s sure to scare! Seance and Party! About two months following their Town Hall event with CEO Ebbe Altberg/Ebbe Linden, Linden Lab will be having another. 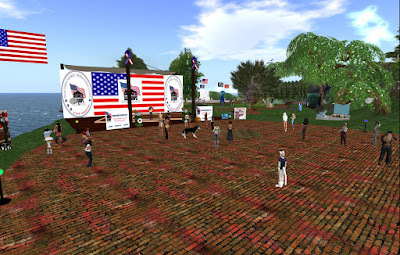 On the official Second Life blog a few days ago, it was announced that there would be a Town Hall event on Thursday November 15. It will take place 10 AM to 11 AM SL time. Speaking will be Oz Linden (who is called Linden Lab's "Director of Product"), Grumpity Linden (Senior Director of Engineering), and Patch Linden (Senior Director of Product Operations). People with questions they would like answered by these three are invited to post them in the Town Hall Meeting forum thread, and do so before November 9. The Lab will chose which of these questions to answer during the event. To see the post in it's entirety: Click Here. On Monday October 22, Trion Worlds, a game developer and publisher, was bought by Gamigo. Trion currently is behind five games: Atlas Reactor, Trove (a Minecraft spinoff), Rift, Defiance, and Archeage. On their website, Gamigo called themselves a "leading publisher" of "various Free2Play MMORPGs and MMOGs," many of them browser-based games. 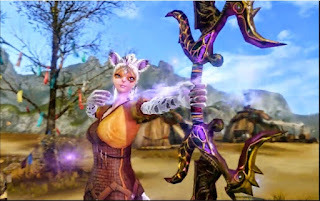 In the Rift forums, one director posted, "...We can confirm that there has been a transaction involving Trion Worlds and its games. While many of the names and faces you’ve come to know in our studios will remain on through this transition, others will not be making the journey. To those who are leaving us, we are forever grateful for your incredible work and contributions over the years. We’d like to assure our communities that the games will continue on in capable hands moving forward, as everyone involved is aiming to make this transition as smooth as possible for you. We will have more information to reveal as soon as we possibly can. 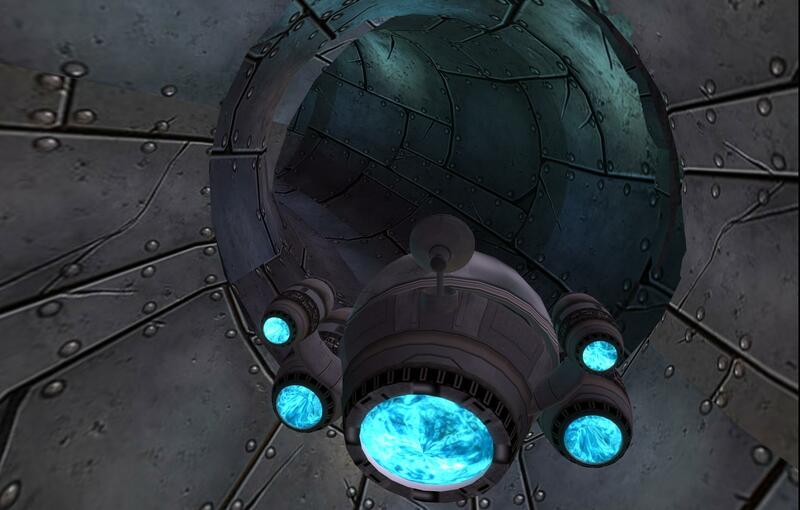 ..."
What followed in the Rift forums were many sad comments, and well-wishes for those whom had been laid off. While a few expressed optimism for the future of the game, more often there were predictions the game only had a few years left in "maintenance mode" with few to no updates. In a statement by Gamigo, the company told, "Trion was acquired via an 'Assignment for the Benefit of the Creditors' process, in which the buyer only buys those assets, with which he wishes to continue the business. In this process, gamigo group acquired the majority of the assets, including the platform, takes over employees to operate the business and gets the full publishing rights of the games. The IP’s of the Trion Worlds games have been acquired by gamigo’s sister company Padmapani GmbH and are made available for gamigo group, worldwide and exclusive." According to an article by Gamasutra, "roughly 25 employees remain at each" of Trion's two studios. With the company having once employed 200 people, fifty are now left. Earlier, it was reported only 25 employees were left in total. A look at Archeage's forum shows that the release of an update that was almost finished has been delayed. There had been some earlier signs of trouble for the company, such as fifteen people laid off in July. With only 25% of it's staff remaining, it is unclear what the future is for updates that are far from complete, or if any more will be made for the forseable future. In 2011, Xymbers Slade reviewed Rift for the Newser, saying it was heavily based off World of Warcraft, but was so good he was spending a lot of time on it. Nydia Tungsten reviewed Archeage in 2014, saying the MMO had a well done storyline and a unique crafting system, but there were some frustrations such as griefing by players wanting to become pirates. 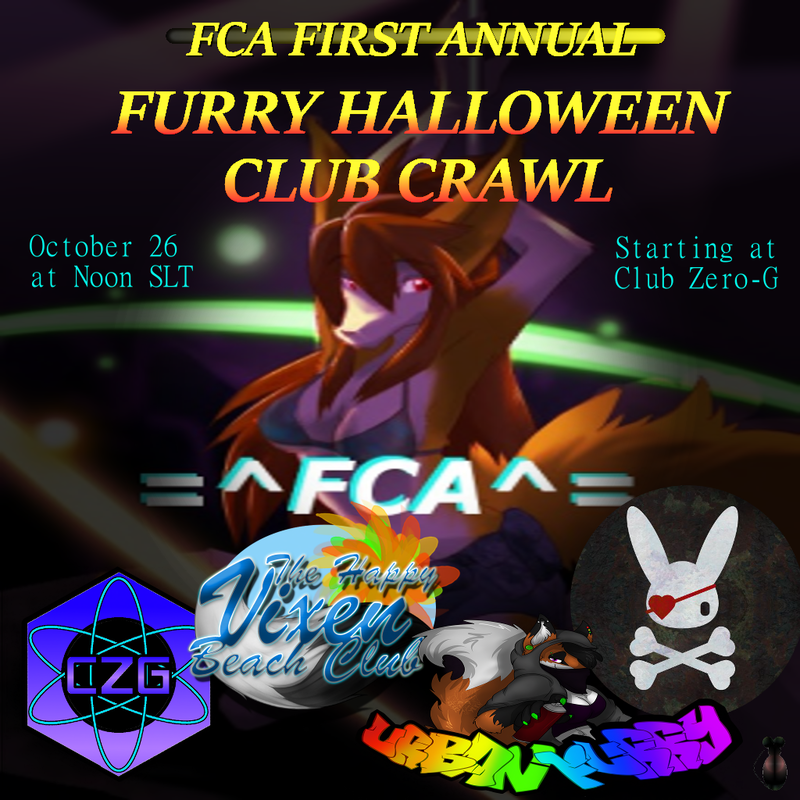 Tomorrow , Friday October 26, marks a ten-hour Halloween-themed event between four clubs: the FCA Furry Halloween Club Crawl. 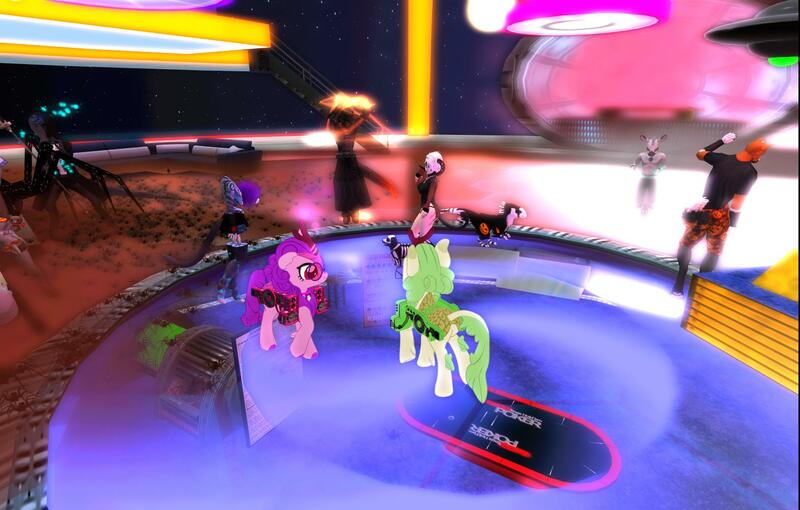 Organized by the Furry Club Alliance, the event involves Club Cutlass, Club Zero Gravity, The Happy Vixen, and Urban Furry. The action starts at 12 Noon SL time at Space Station Club Zero Gravity. At 2PM, the crowd will head to the Happy Vixen's Haunted Manor (the beach club is closed to regular events). At 4PM, it's time to head to the city to Urban Furry. At 6PM, the party heads to the sky to airship Club Cutlass. And from 8 to 10PM, the crawl ends where it began, back at Club Zero Gravity. Another one from the Falmouth Hotel. In a community filled with foxes, wolves, bunnies, and felines, someone in a goat avatar is going to stand out. But Cynthia Farshore is more than just that to the Sunweavers, and Caledon where she has been appearing more. Besides being a sim owner, she's an accomplished builder, DJ, and noted member of the Sunbeamer Relay for Life Team. 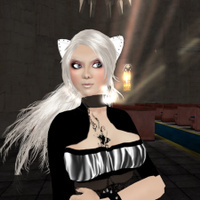 Deaflegacy recently interviewed her, and Cynthia had a number of things to say about her nine years in Second Life. Gemma Cleanslate is back once again from her search for more spooky places this Halloween season. One is a scary location set up by Akino's beach. But this haunt is anything but a day at the beach with frightful sights and sounds that can sent one running to the exit. Deepwood Manor gets it's name from Deepwood Forest where it's in. This haunted house has plenty of unnerving thrills and chills. the horrors from the shadows creep. as demons dance beneath the moon. a sudden terror grips your chest. to slink after a black hellhound. to fill the night with clacking bones. move through the streets with deadly grace. "Where fare ye, denizens of the night? Where are ye bound with such delight?" transfixing you - the end seems nigh. and says "Come dance with us a while! Are ye brave enough to heed the call? Listen up, all you Gothic Ghouls, Steampunk Skeletons, Victorian Vampires, and Maniacally Mad Scientists! Join us in the Haunted Ballroom in Caledon Mayfair on Friday, October 26th for the Eighth Annual ScreamPunk Ball!!! Halloween costumes with a steampunk twist are encouraged (as are steampunk outfits with a Halloween twist); fun and laughter (and the occasional scream) are mandatory. Halloween music will be on in the grove all day long, so come by to explore and soak up the atmosphere. From September 22, RacerX Gullwing and the Giant Snail Racers have their "Oktoberfest" race. The first race was won by Fionafei, with BrianTopp second and Lobbie Riggles third. In the second race, BrianTopp won, with Fionafei second, and Aldin Cortes third. Mist is rising, can you see? Do the crystals glow for thee? Dance tonight, let come what may. Come celebrate a Candlelight Ball with the Gold Dragon as we dance in a lovely gothic setting: spooky, elegant, and fun. Let's dress up a little, but in costume or not, all are welcome. Wed., Oct. 24th. Music begins at 6:30 SLT. With all the black in the setting, the Gold Dragon advises you to set your viewer on Midday, or some other daylight hour. Midnight is too dark to really enjoy the build. Klaus Bereznyak is back from his search for Halloween stories. 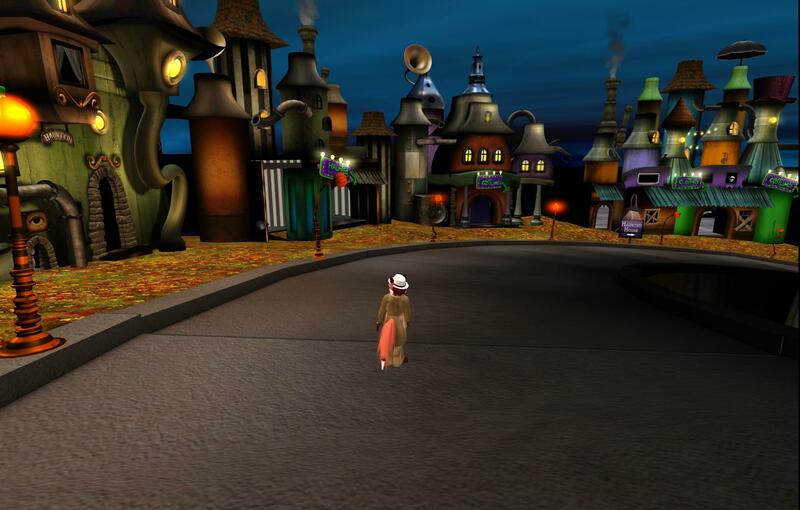 He traveled to the Bayou Chat Noir sim where he found "The Cat People Halloween Hunt." Based on the 1942 movie "Cat People," players need to find ten clues across the area, which will take you through some spooky-looking scenery. Solving the mystery gets you some prizes. That is, if you're brave enough to solve the mystery. The Newser's search for Halloween haunts takes it to Caledon where it was informed about two places there sure to give some spooky thrills for visitors. 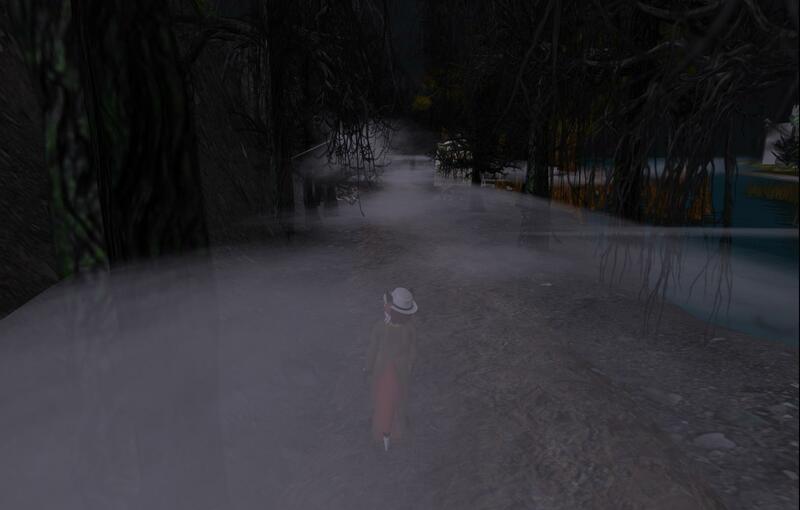 One is at Star Estates, which offers a haunted trail which offers a choice of going by foot or boat. 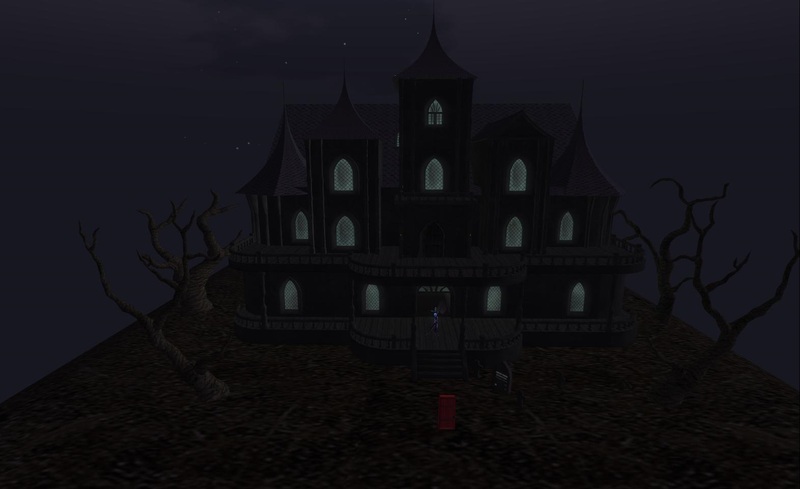 The other is Caledon Downs Haunted Land, designed by Cynthia Farshore, which offers plenty of spooky tricks, but also some treats. As the days get shorter for the people in the Confederation of Democratic Simulators to decided on whether or not to run, several people have thrown their hat in the ring. So far, Tanoujin Milestone, Rose Gray, and Lyubov (20180414) have declared their candidacy for the Representative Assembly. Hannah Marie Tempestwolf's (Han Held) had declared her intention to run again for another term as Chancellor. But last week, she posted an angry group announcement to the community following finding the CDS Museum which she runs almost completely empty. She would later announce she was withdrawing her candidacy for reelection, explaining what happened in her blog. Since Han's withdraw from the election, two people so far have declared for the Chancellorship: Drewski Northman and 恭子 Kyoko (Samara Barzane). With two candidates, this means a race and campaign for the CDS next month. CDS Citizens, those who own property on the community estate sims, have until 12 Noon SL time on October 31 to declare their intention to run for an office. The campaigns officially start November 3, and the polls open at Noon SL time on Nov 10, and close a week later on Noon SL time Nov 17. 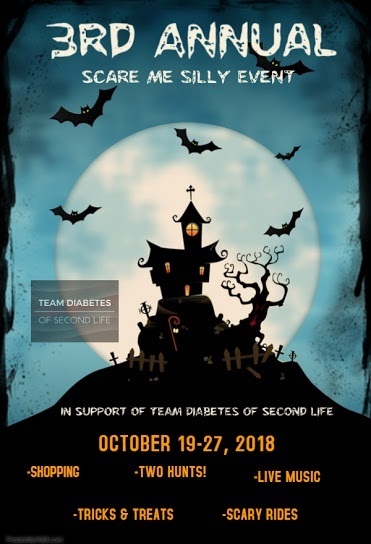 The 3rd Annual Scare Me Silly event returns in support of Team Diabetes of Second Life! This event, is the first fundraising event for Team Diabetes of Second Life and features two hunts, live performers, dj’s, an art show, shopping, and lots of tricks and treats! Participating merchants include: oYo Breedables ,RP Roped Passions , Couture Chapeau , SK Kiva Studios Boutique, Xpllicit Designs , Firelight, Spyaralle, Team Diabetes of SL Merchandise Store, Park Place Home, Pixelancer, Esoterica Threads Clothing , Redangel Designs, LC Fashion, Closer to the Heart Creations , Fjordian Slip, BRYNE, Rush Love Your Look, Tayren's Fantasy Fashions , Feyline Fashions , MMP Muircastle Motors & Parts, Stone Soup, De Baza, Twitchy's Dragonsmeld, GypsyRose Botanical, The Chrone's Garden, Mara's Mysteries , TRS Designs , Just Ordinary, Bento Alive , Khargo Halloween, Cosmos Boutique, Lunar Seasonal Designs, Chiffon, Tylar's Treasures, @AdReNaLiZeD@, Kushi Textures & Mesh, *DBS* Designs By Soosy, Littlefangs, POM, Kittycat's Creations , Sweet E's Designs, Image Essentials, Fae Fantasy Creations, Roosters n cHix, The Art of Talitha Alice, The Pumpkin Head, & Halloween Delights. Participating artists include: Bellissa Dion, Eucalyptus Carroll, Glasz DeCuir, Eleseren Brianna, ilyra chardin, talligurl, Kapaan, Neoma Vasilia, Myra Wildmist, Jamee Sandalwood, Sheba Blitz, HADIYA DRAPER, Ladmilla, Marcel Mosswood, Veruca Tammas, & IsarValdetaro Resident. On Friday October 19, the Burn2 event started. The largest annual art and music festival in Second Life, it is based on the Burning Man festival which takes place in the summer. The event will go on until October 28, though the builds will likely be up for a little longer. This year's theme is "I, Robot." As usual, the center build is "The Man," a man-shaped structure of wood that will be burned near the end. Often a towering figure, or on a tall base, this year's Man is a smaller one on a large wide base. Elsewhere is "The Temple," which resembled a firey oven. 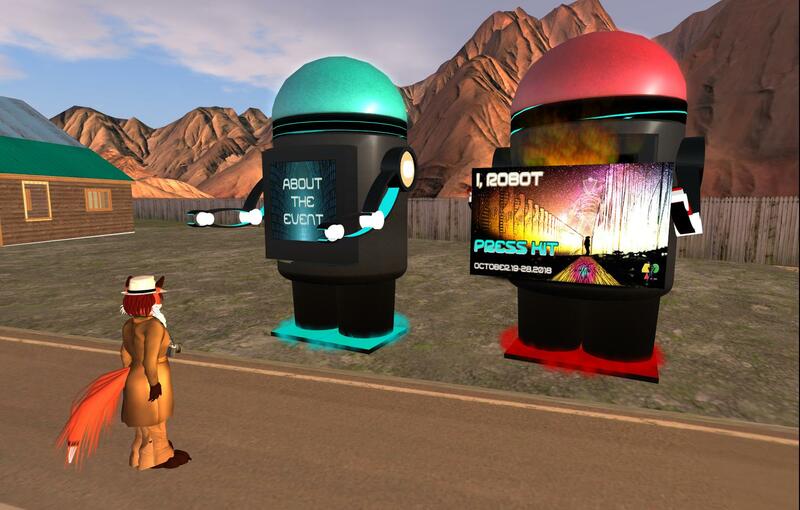 With the theme "I, Robot," artists were invited to make exhibits with robots as a theme. Some expressed hopes or fears of a world filled with intelligent robots. Others were simply amusing. And besides the exhibits there were events by DJs in which people danced to the music. The festival will last a while, but not forever. Be sure to drop by before October 28. 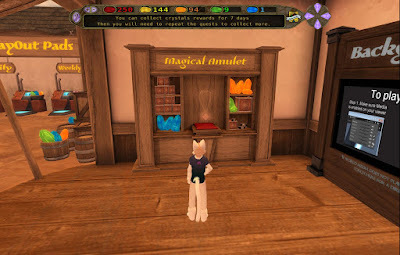 Taking a look at the rules for the updated "Linden Realms" game, I was unsure about whether or not accounts that hadn't bought or sold Lindens, such as alts, could collect Linden dollars from finishing "The Search For Magellan" quest for finding the pieces for the amulet. "You must have a payment method on record with Linden Lab, and you must have used it at least once," the rules stated. Well, in the case of alts, it seems the answer is they can. I finished the quest, brought back the pieces of the amulet, and got a small Linden dollar reward for my efforts. 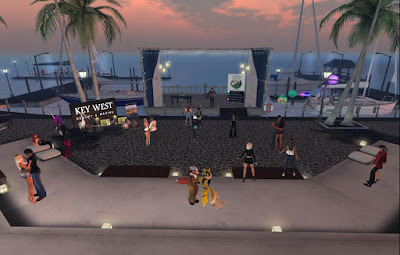 Last week, I dropped by a performance in Key West by Jaycatt and Frogg. After over a decade, the musical duo who make numerous live performances in Second Life are still going at it, Frogg on his guitar, and Jaycatt behind the piano. The one big change is that it looks like Frogg has put aside the old amphibian avatar he used to have. Jaycatt is still feline, though. Besides Key West, they perform at other places, such as Luskwood. 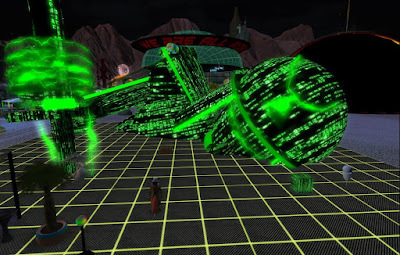 From Nitwacket in March 2008, "Three residents of the Virtual World, Second Life - located in Japan, Germany and the USA. Song by Vampira Kanno - recorded with Apple Garageband. Machinima by NITWACKET - Pyewacket Bellman & Niten Altamura captured in Second Life - edited in Apple iMovie0,"
You see a cool item on Marketplace that you'd like to have, but you don't have the Lindens you need to get it. In the past, you'd write down the name on a piece of paper somewhere and hope you don't lose it. Now there's another option: Marketplace Wishlists. This was added in an update last week. 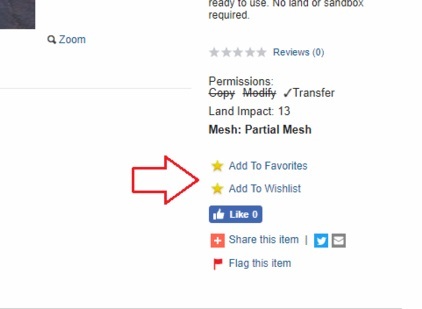 The "Add to Wishlist" option is in the lower right corner. 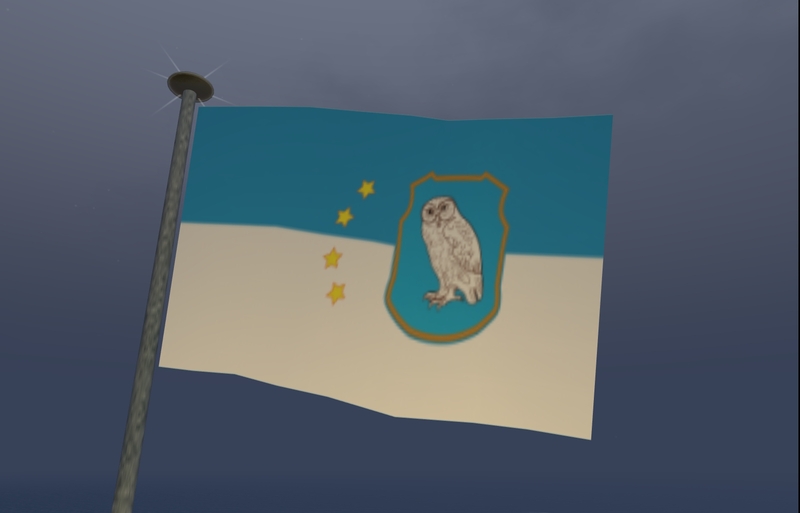 To view your own wishlist, go to https://marketplace.secondlife.com/wishlist . You can also add an item to your favorites to show to others later. 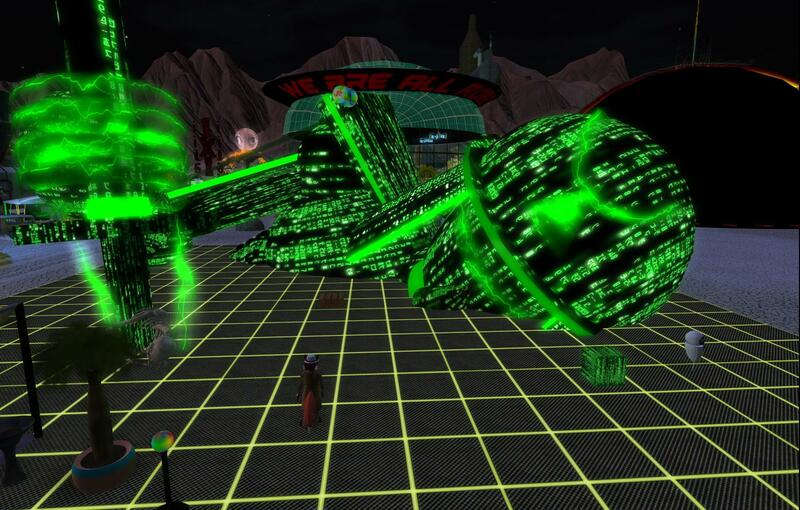 To get to your favorites page, head to : https://marketplace.secondlife.com/favorites . You can also follow a certain merchant by adding them to your favorites on their store page, and return to the page quickly by going to your favorite stores page : https://marketplace.secondlife.com/favorite_stores . You can also "Like" an item for Facebook (this feature may not be brand new), and there's a button to quickly share the item on social media. One third party viewer for Second Life that got plenty of use in the recent past was Singularity. 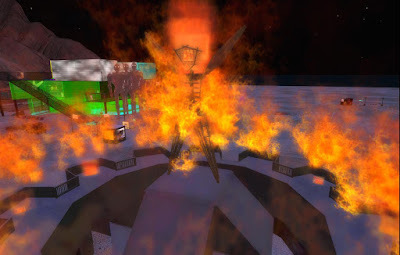 Developed to resemble the classic Linden viewer before they changed to V-2, for a time it was the second post popular viewer with only Firestorm getting more use. It would be updated every few months until February 2015. 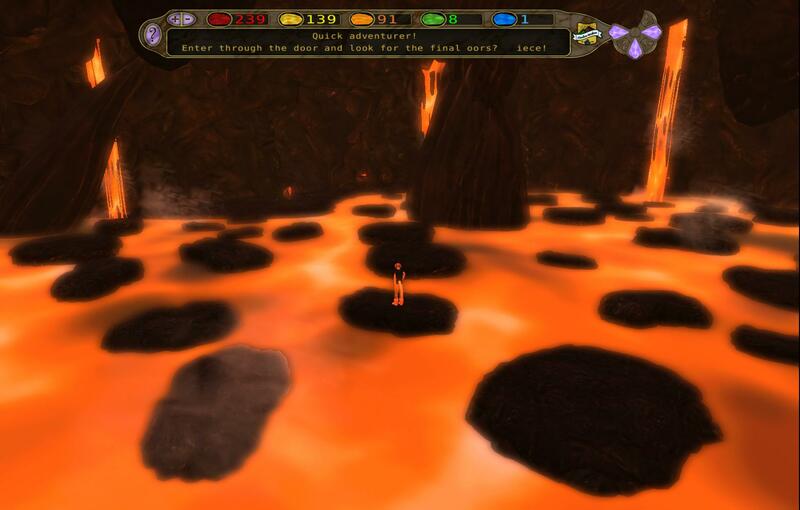 Afterwards it would be hit with a number of problems such as one developer dying and another leaving the team. It would come up with one more update in June 2016. But there have been none since. While the viewer still works, some newer avatars don't rezz properly with it, sometimes in ways that block much of the screen. Siana Gearz, the head of the Singularity team, recently made a page on Patreon, a membership platform site that allows content creators to receive funding from supporters, or patrons. Apparently, her financial situation has gone downhill, saying, "the project has been extremely draining in part because it left me bankrupt." So she had created the Patreon page to "gauge interest to continue Singularity Viewer ... if people are willing to pay, it changes things. You can also pledge here if you choose to support me in new endeavours, which are likely to be 3D printing related, probably firmware development." So far (as of the writing of this article), Siana has a total of six patrons pledging $23 a month, including five "Singularitians" whom want her to concentrate on improving the viewer. More information can be readon her Patreon page: https://www.patreon.com/sianagearz . 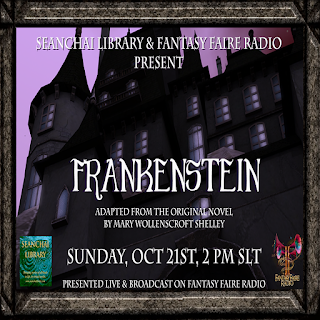 Second Life – On Sunday, October 21st at 2pm slt, Fantasy Faire Radio and Seanchai Library will present Mary Shelley's "Frankenstein," specially adapted for radio and live performance in six voices, in celebration of the 200th anniversary of the novel's original publication. The two-hour performance will take place live at this year's iteration of "Haunted Holly Kai" high above the Blake Sea based Art Park, and will benefit Relay for Life. The novel, "Frankenstein; or, The Modern Prometheus" was written by English author Mary Shelley that tells the story of Victor Frankenstein, a young scientist who creates a human-like creature in an unorthodox scientific experiment while still a student at University in Ingolstadt. Shelley started writing the story when she was 18, and the first edition of the novel was published anonymously in London on 1 January 1818, when she was 20. Her name first appeared on the second edition, published in France in 1823. In 1931, Universal Pictures released "Frankenstein: The Man Who Made The Monster" directed by James Whale and starring Boris Karloff as the Creature (now "Monster"). The screenplay was based on Peggy Webling's stage play "Frankenstein" which was loosely based on Shelley's novel. It is here that the Frankenstein as the green-skinned, bolt-headed, mad scientist experiment-gone-wrong took shape, forming the popular culture version that pervaded the 20th century. In Roman religion, the Lemuralia or Lemuria was a feast during which the ancient Romans performed rites to exorcise the malevolent and fearful ghosts of the dead from their homes.Our Lemuralia ritual will banish any malevolent spirits, both real and imagined, while welcoming the protective spirits of the Lares and beneficent ancestors. Please bring ghost stories to share aloud afterwards in the ROMA tombs! Come celebrate the Roman version of Hallowe'en with us! In honour of the festival, we will have a costume contest hosted by Kevinus Aemilius Kadora. 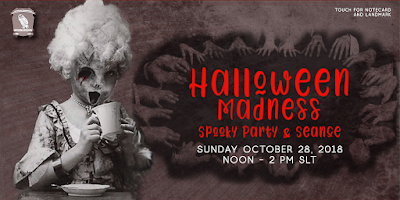 Dress as any monster, ghost, or undead creature you can imagine - costume winners (top 3) will win cash prizes compliments of Gens Aemilia! Ghouls and goblins, witches and forest spirits are all invited to the final Grand Feast! Join your neighbours, guests and friends for this Hallow'een feast, with live music by Franklee Anatra! 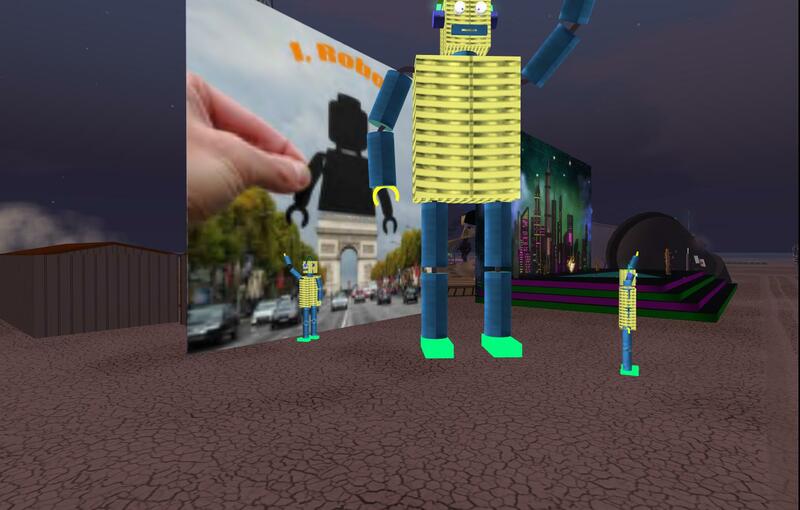 As we do every year, we invited artists and creatives to get their plots to create homes and art installations in this virtual temporary city on five sims, with a challenge to build to a science fiction flavoured theme, “I, Robot,” within the framework of the Ten Principles of Burning Man and a set of build guidelines. The response from the community has been marvelously varied. Some are built around the Three Laws of Robotics as set out by Isaac Asimov. Others explore ideas about the relationship between humans and AI, or express very real fears and doubts about the future. There are still others that are simply funny and fun to explore. And not the least among these are the simple camps for those who want to merely sit a spell, relax and soak in the tunes in the air. This year, we invite you to experience art that examines how it feels to live in a world filled with robots. When you step foot onto the dusty playa, you are no longer a mere bystander but a part of the spectacle that is I, Robot. SHARE the News and Plan to Come! We look forward to welcoming Home Burners and community. Experience Burn2 once again, walk through the gate, and if you are a virgin Burner, ring the bell! Follow the Lamplighters on their twice-daily processions; visit the Rangers station, view the Man and pause to reflect in the Temple. Wander, explore, climb, interact. Visit the three stages with music to soothe, inspire, excite and incite to dance. You will be surrounded with art and music, and generous Burners inviting you to participate. See the full BURN2 Calendar at http://www.burn2.org/calendar for the week’s event schedule.